The California primary is June 8th, which means it's time for inundating one's mailbox with political fliers. Except I've noticed something odd. My daily mounds of pamphlets have not been for the governor or U.S. senate races - two of the most high profile in the country - but rather for...the 53rd State Assembly. Previously, I couldn't have even told you what Assembly district I was in. But the oddity gets worse. 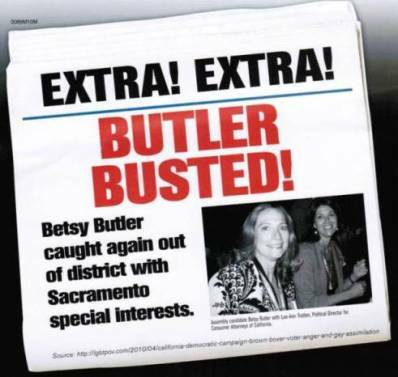 You see, from the start, almost every flier pouring in was a scathing indictment of just one candidate, someone named Betsy Butler. I'd receive several of these blasts every week. Some days, I'd get two. In the pocket of lobbyists. Doing the bidding of the proverbial Special Interests. These blasts went on for weeks. Unchallenged. Eventually, you figured she would respond if they weren't true. But nothing. They had their quotes, pictures, had her dead to rights. It was everything wrong we all think about politicians. I'd never heard of her, but nothing I read made me wish I had. She of course said she isn't what these fliers are printing at all. But something struck me as off. Because she wasn't just saying that the fliers were unfair. She was saying things that made it seem like the fliers weren't even on the same planet of being accurate. It was like if someone accused you of being the worst quarterback in NFL history, and you actually played guard - and the sport was basketball. We've all seen enough of charges and defenses to recognize the gray areas in political fliers. But this was talking two different languages. Someone wasn't being totally honest here. Or honest at all. 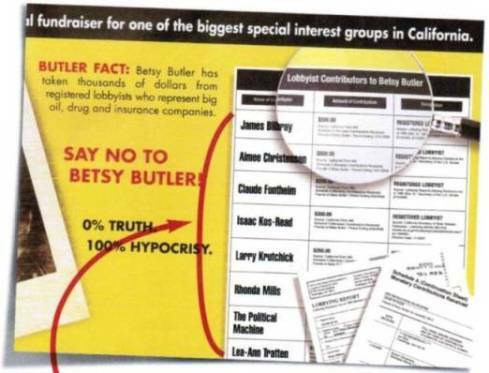 There it is, clear as day: "Lobbyist Contributors to Betsy Butler," highlighted by a magnifying glass, so that you can't miss it. ...not one of them is a registered lobbyist in California. But I went further, and looked into who the people were. Those charged with representing "big oil, drug and insurance companies." Because maybe there's something hidden there. In fairness, I wouldn't want these people as my investors, either. I'd want them as my best friends. To be fair, it's possible these people lobby outside California. And possible not. Though that's no conflict. But even if they do lobby, it's on behalf of the environment, health care and global poverty - not for big oil, drug and insurance companies as charged. Sort of the polar opposite. However, the last person on the list, Lea-Ann Tratten, bore special attention. You see, she got her own damning flier. It has a photo of her smiling with Betsy Butler. Busted! !, it blares. In fairness, it's hard to tell if they're at a cabal or a Grateful Dead concert. And in fairness, too, Ms. Tratten may well be a lobbyist. After all, checking her background, she's the political director of Consumer Attorneys of California. But the pesky problem is, remember, she's not a registered lobbyist in California. So, to look into things further, I went to the CAOC website. And here's what the CAOC says about cases their members take on - that any person they will represent must face "an opponent with far more power and access to resources: polluters, governments, insurance companies, automobile manufacturers, and banks. CAOC members take cases they view as worthy," adding "and are paid only from those cases which are successful." Mind you, at this point I still don't know much about Betsy Butler's politics. But I'm getting to know a lot more about the devious smarminess of her opponents. That's when Ms. Butler's own fliers started to show up in earnest. And they showed her endorsements coming from such organization as the Child Abuse Prevention Center, Los Angeles County Fire Fighters Association, California Nurses Association, Planned Parenthood, and the Consumer Federation of California. Not the sort of groups you generally presume are in bed with, oh, say... big oil, drugs and insurance companies. Like or dislike Betsy Butler's political positions is one thing - but it's totally out of the ordinary to have such unrelenting pounding and factually inaccurate savagery directed at a candidate for a simple state assembly position. Someone is paying a whole lot of money to muddy very shallow waters. One thing leaped out, of course. Most of those non-lobbyists listed in the fliers were people involved in global warming, emission controls and other environmental issues. So, you have to wonder who would expend so much money to defeat such a candidate - let alone have enough money to do so. I don't have the slightest clue if there is big oil money behind the smear campaign, but any objective view would certainly suggest it's to the interest of big oil that she lose. Sometimes playing "connect the dots" is much too easy. Actually, this isn't "connect the dots," this is opening your eyes and looking. COAP offers medical insurance. Betsy Butler is supported by attorneys who defend people killed by defective drugs. Honestly, in fairness, if I was COAP and trying to limit medical liability, I wouldn't want to see do-gooders like Betsy Butler in office either. What I wouldn't do, though, is lie about her. I wouldn't try to smear her. But hey, that's just me. I don't know enough of the underpinnings to know all the motivations going on all sides. But any fair, objective reading of the material makes is seem clear that it is the big oil, drug and insurance groups who have the most to gain by smearing someone backed by environmentalists, medical attorneys and consumer protection groups and defeating Betsy Butler. Admire Betsy Butler's politics or not, that's a personal matter. But these attacks are spectacularly underhanded, venal and have no place in our life. I have no idea whether or not I'll vote for Betsy Butler. But if I do, part of the reason will be because of these despicable, lying attacks. Because anyone who is making big oil, drugs and insurance companies want to defeat her so badly... she must be doing something right.